I wrapped up yesterday's all morning fudge making marathon with four flavors: Pomegranate, Espresso Chocolate, Baileys Vanilla Bean and Peppermint Mocha. I've recruited Mr. Humble to sample all the flavors and he is groaning, but I am pretty sure they are happy groans. This is some great fudge. I am very happy with how all these recipes turned out, each has great flavor and texture. I'll post two recipes today and then the rest tomorrow. So... you know, stay tuned! Yes, I know there have been a lot of peppermint flavored items on the blog lately, what can I say, 'tis the season. Besides, I adore the occasional Starbucks peppermint mocha, so I need to create a fudge version. Please note that this recipe calls for instant espresso powder, so don't try substituting instant coffee or worse, coffee grounds. Doing so will make me cry. Line a 9x9 inch pan with foil and coat with a little nonstick spray. Combine sugar, butter and milk and cream into a heavy bottomed sauce pan-- again I recommend non-stick--and bring to a boil over medium heat. Once boiling, attach a candy thermometer and reduce the heat to a hair above medium low and cook for 7-10 minutes until your thermometer reads 234°F , stirring constantly. Once your mixture hits the appropriate temperature, remove from heat and grab a wooden spoon. Add the chocolate chips stirring vigorously until the chocolate is completely melted and smooth. Sprinkle in the espresso powder while stirring. Add the marshmallow creme and peppermint oil and mix until well blended. Pour the mixture into your pan and sprinkle with the crushed candy canes. Allow to cool on a wire rack until room temperature. This fudge came out great, rich and creamy with the flavor of Irish cream. Om nom nom. Line a 9x9 inch pan with foil and coat with a little butter or nonstick spray. Combine sugar, butter, heavy cream and Irish creme into a heavy bottomed sauce pan and bring to a boil over medium heat. Once boiling, attach a candy thermometer and reduce the heat to a hair above medium low and cook for 7-10 minutes until your thermometer reads 234°F , stirring constantly. Once your mixture hits the appropriate temperature, remove from heat and add the white chocolate chips, stirring vigorously with a wooden spoon until the chocolate has melted and the mixture is smooth. Add the vanilla bean and marshmallow creme and mix until well blended. Pour the mixture into your prepared pan and allow to cool on a wire rack until room temperature. If you're in a rush you can also cool both of these in the fridge without any ill effects. Both these fudges freeze well and are best stored in an air tight container or wrapped, at room temperature. Hi there - is marshmellow creme " Fluff" ? Thank you! Yes, I believe so. Fluff and creme are essentially the same thing. So you should be able to use both in these recipes. Dana: I had always been under the impression that Fluff was just a brand of creme. I understand this to be 1/3 cup, based on the peppermint mocha's recipe portion of it, is that right, or is it maybe 1/3 pint? Sorry, that is 1/3rd of a cup! I seem to be making a habit out of dropping units when typing out my recipes. Thanks for pointing it out, I'll fix that. Your blog looks great! We'll have to try one of these recipes! Absolutely love your blog. I made the peppermint mocha fudge this weekend for a cookie-swap party, and it was so delicious! And easy!!! I didn't have a candy thermometer, so thank you for putting in approx. cooking time--I let it cook for 8 min, and it seemed to do the trick. Can't wait to try more of your recipes! Yes, you can use peppermint extract. Just use roughly one drop more extract in this fudge as it isn't quite a strong a oil. The fudge is usually cool enough to taste test at this point too (before you pour it into the pan). So feel free to double check the flavor. You don't need a lot of mint flavor in the fudge itself, just a hint. As it mostly relies on the candy canes to give it the peppermint kick. I'm so glad the fudge came out great! Though, I wouldn't personally recommend cooking candies purely based on times given. As it is not impossible to take a pan of fudge to toffee-like hardness in 8-10 minutes. So other folks might not get as lucky as you did with the fudge. It all depends on the heat applied and since everyone's stove is a little different, I prefer folks use a candy thermometer. At the very least, people attempting this recipe should use the cold water method to determine the temperature of your sugar syrup. Thank you so much for the peppermint mocha recipe. Your instructions were so helpful. I was very thankful that you said how long the butter, cream, and sugar should cook for because my thermometer did not work properly. The texture is amazing! This is definitely going to impress my fiance's family this Christmas! I made the peppermint mocha fudge today. This is the best fudge I've ever made! Thanks for the recipe. hello, i live in germany and i don't think that i can purchase marshmallow creme here.... could you recommend an equivalent product? My mother lives in the UK and she has bemoaned the same lack of marshmallow creme there (and candy thermometers, she can't find one anywhere). There really isn't an equivalent product in the UK or Europe, or at least one that I know of (I send back jars of the stuff to her when she comes to visit). If anyone in the UK or Europe knows of an equivalent please let me know. Of course, that doesn't mean you can't make fudge in these flavors. 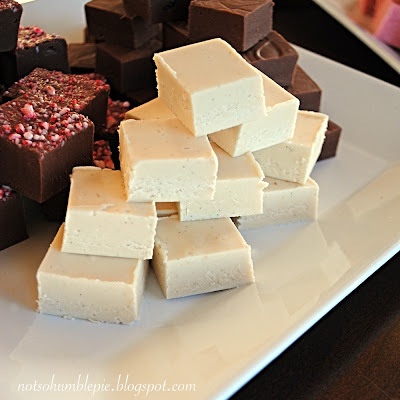 Many more traditional fudge recipes--ones that don't require marshmallow creme--can be modified. Peppermint mocha in particular just requires a basic chocolate fudge recipe with the addition of espresso powder and crushed peppermint candies. The Baileys fudge can probably be made from a modified traditional opera or white chocolate fudge, reducing the amount of milk or cream and substituting the Baileys. It might just take a little kitchen experimentation. Late to this party, but bookmarking for next Christmas. One question -- can I really not sub a tiny bit of superfine coffee grounds dust for the instant espresso powder? *really*? On what grounds (har har) do you make this requirement? I guess I could state the obvious by noting that instant espresso powder isn't the same as coffee grounds (when it comes to taste or ability to impart flavor). If you're looking for a substitute, Starbucks Via coffee powder would be a better option. Though, if you wanted to play with the recipe and experiment. Try brewing the grounds in the cream. Bring the cream to a simmer over medium heat, add the grounds and cover. Remove from heat and let stand for 10 minutes? Then strain out the grounds and use the coffee infused cream for the recipe. For those asking about substitutions for Marshmallow fluff: when I basically mass produce fudge for Christmas gifts, I just measure out 7 ounces of mini marshmallows - so much easier than trying to scrape fluff out of a jar! Hello! I've had this recipe (for the Baileys) book marked FOREVER and a day and finally tried it this afternoon. I am now the favorite of the house hold....they all loved it!!! Thank you very much for the awesome recipe!!! This is pure ground vanilla I'd use, not vanilla sugar.